Clear Stickers Let You See What's Underneath. Clear sticker printing expand the possibilities of sticker design by giving you transparent text and graphics or a “no label look” should you choose. While they do work well as product labels, these stickers excel on transparent surfaces such as store windows, cooler doors, windshields and beverage containers. Transparent stickers also good for instances that you might want to show off the surface you’re attaching the label to, such as with clothing labels. This can make for a dramatic and memorable sticker design. The clear BOPP stock used for clear stickers is also scratch-resistant and waterproof, making them a good choice for outdoor applications. They can also be used on products that would normally be frozen or immersed in ice water. Fill out our custom order form or give us a call to order your clear stickers. Use our Clear Sticker layout templates to ensure your artwork and designs are sized and formatted correctly. PrintPlace.com layout templates can be downloaded for each Clear Sticker size below, in an EPS, PDF, or JPG format for Illustrator or Photoshop. If you have a metal surface for instance, you can create designs with negative space to allow the surface to peek through at those spots, creating an interesting effect. Transparent beverage containers and windows are just some of the surfaces where clear stickers make a difference. 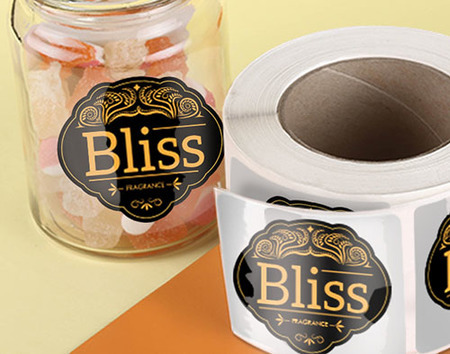 Whether you’re using them for decor or for labeling, clear stickers can help maintain the functionality of those items. This makes make a popular choice with craft brewers who use clear bottles.